Enjoy a rare and historic look into one of the most distinctive shapes in the sky ... the A-7 Corsair II! Having entered service during the Vietnam war, this mighty war bird soldiers on in the capable and trustworthy hands of airmen proudly serving Greece and the Hellenic Air Force. 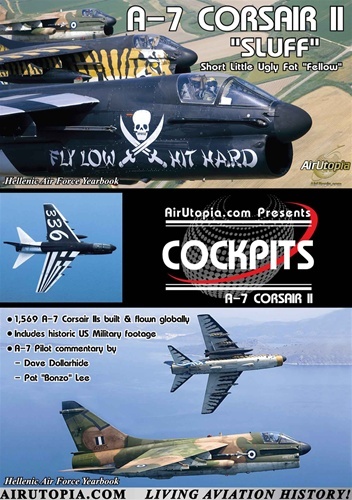 1,569 A-7 Corsair IIs built and flown globally! A-7 Pilot Commentary by Dave Dollarhide and Pat "Bonzo" Lee! Run time for this A-7 Corsair II video is about 60 minutes. Format is NTSC DVD and region-free.